Steeped deeply within the 180 feet wide and 20 feet deep moat that girdles the Kot-Bagh Nizam or the Ahmednagar Fort of the Nizam Shahi dynasty (1490-1600 AD) lies a slice of resurgent India’s silent struggle for Independence. This oval-shaped, impregnable fort, which is over a mile in circumference, has seen the Nizam Shahi, Mughal, Maratha and British rules. Besides, many Indian leaders were imprisoned here while fulfilling their dream of independent India. Recently I was on a visit to the home of the Army’s elite tank Armoured Corps stationed in Ahmednagar in Maharashtra, under whose aegis the centuries-old fort has been since Independence. The not-so-long-ago historical past came flooding in, bringing with it memories of the Nehruvian literary bent of mind that shaped the nation’s destiny. Within the bowels of the fort lies a set of military barracks facing each other and in this new abode were interned for three long years, top leaders of the nation. They were all put up in what is now termed the Leaders Block, in small separate rooms. All 12 of them had one large common room where they gathered to read select newspapers and periodicals that were allowed and discussed the day’s events, besides reading and writing letters that many of them would have received from relatives and well-wishers. The wing right across the Leaders Block housed offices of the jail wardens. This prized crew was guarded not by British Indian Army soldiers but the Indian police. The prisoners had a common dining mess and they all had to eat on one table. Because of the age factor, there was considerable latitude in what these political prisoners could do. Thus they were left to their own devices the whole day. There was a Lights Out and a Day Break rise call. Reading, writing and playing badminton in the yard between the two barracks, was the main pastime. Who were these leaders who lived out their confinement in the early mid-1940s in this secluded and well-guarded fort at Ahmednagar? Interestingly, all the top leaders were imprisoned together on August 10, 1942 and with the exception of Dr Syed Mahmud and Dr P. C. Ghosh, who were released on October 6, 1944, and May 20, 1944, respectively, all the others were only let off in 1945. Pandit Jawaharlal Nehru was released on August 28, Maulana Abdul Kalam Azad and Sardar Vallabhai Patel on April 17, Pandit Govind Vallabh Pant, Pandit Harekrishna Mahtab, Acharya J.B. Kriplani, Acharya Narendra Deva in the period between March 27-29, Dr B Pattabhi Sitaramayya on April 5, Asif Ali on April 3 and Shri Shankar Rao Dev on April 18, all in 1945. A staggered release was not only administratively more preferable, but the aim was obviously to break up at least temporarily the 12 hailing from different parts of the country so that crowds could not gather at one place. Those were the turbulent days of the Independence movement. Mahatma Gandhi, who incidentally supported the employment of the Indian Army in World War II was still out. His confidant Nehru was, of course, released last. All this made perfect sense to the British. It also possibly helped Nehru to take his time writing his magnum opus, Discovery of India, which was started and completed within the room he occupied in the Ahmednagar Fort. The Armoured Corps Record Office which moved into the fort in 1947 has meticulously preserved all records of the time. For this the Indian Army and the Commandant of the Armoured Corps Centre and School, Maj Gen J.P. Singh, and those before him deserve the entire nation’s gratitude. Inscribed in a register is an entry by Nehru that says, "This is my third visit to this fort. The first visit was the longest — when we were detained here for nearly three years 1942-45. The next time I came in May 1953 just to see how this place looked like and to revive old memories. And now eight years later, I come again and the past comes up before-the quiet uneventful past when we lived here and could only hear very distantly the far-off drums of the Great World War that was going on then. Jawaharlal Nehru, May 15,1961." 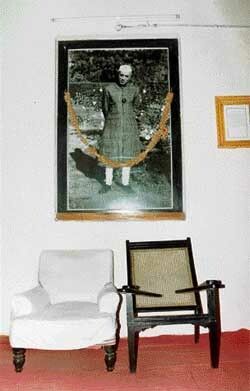 As I went around, I saw Nehru’s armchair which was the fashion in those days, the side table, the black bordered hanging wall mirror, the sober towel stand, and the enamel jug and washbasin, all neatly in place — preserved for posterity. A copy of Discovery of India lies therein. In the quiet courtyard placed in between the two barracks is still preserved the round platform that Nehru and others used for their deep breathing exercises and yoga. On Republic Day and Independence Day, the Fort is opened to the general public. Within the ramparts of the Ahmednagar Fort lies a large slice of India’s contemporary history and its freedom struggle.